Article Nov 13, 2018 | By Dr Carl Robinson. A single bacterial cell on its own is vulnerable to attack by immune mediators, antimicrobials such as antibiotics and even other bacteria, and like many living things they can benefit from safety in numbers. But bacteria take communal living to a whole new level, forming veritable civilizations - the bacterial biofilm. 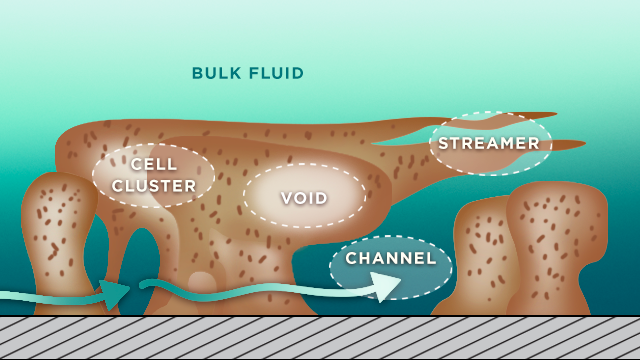 What is a biofilm and how does a biofilm form? Biofilms in both Gram-negative and Gram-positive bacteria are highly organized, functionally heterogeneic communities of bacteria. Their self-made hydrated polymeric matrix has channels for nutrient acquisition and waste disposal. This structure not only provides protection from harm but allows them to exploit the available resources, so they can persist under stressful conditions where oxygen or nutrients for example may be in short supply. Triggers for biofilm formation vary between bacterial species and are not well understood in many. However, broadly speaking it is thought to be a survival mode response to stressors in the surrounding environment. A whole host of bacterial species, including Streptococcus, Neisseria and Actinomyces embrace a biofilm mode of growth when conditions are right. Some bacterial species are better adapted to different functions, such as surface attachment, than others and consequently it is not unusual for multiple species to be present in a single biofilm. The upside is that cooperation in these complex interspecies networks can often produce synergistic benefits to all involved. Biofilms are found in diverse corners of the globe, from medical devices and food preparation surfaces to rock pools and even your mouth. The robust nature of the bacterial biofilm makes it hard to remove once established as antimicrobial agents struggle to penetrate and eradicate the bacteria within. Consequently, whilst they provide a haven for bacterial survival, they can also be very challenging to remove where they are unwanted. It has been estimated that 80% of human infections begin with polymicrobial biofilms so it is clear that they are a significant health issue. Measuring a single endpoint is not sufficient to capture the complexity of bacterial biofilms. 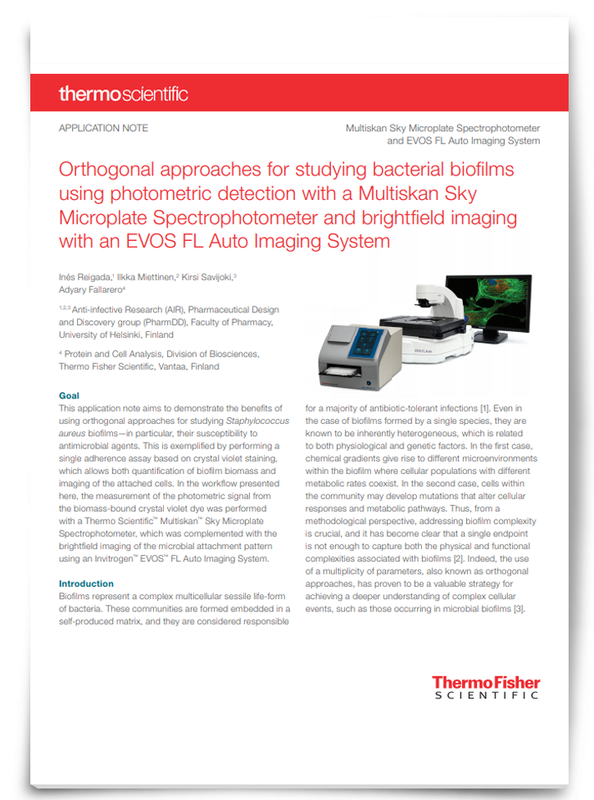 In this app note, we demonstrate how to improve the early discovery of biofilm inhibitors, by using a multiplicity of biofilm parameters, by combining the Thermo Scientific™ Multiskan™ Sky Microplate Spectrophotometer and the Invitrogen™ EVOS™ FL Auto Imaging System. Whilst our skin protects us from invading microbes, surgical interventions break this barrier. The insertion of medical devices be they totally internal, such as joint replacements or pacemakers, or bridging the gap between the body and environment, such as catheters and ventilators, provides further opportunity for bacterial invaders to establish persistent infections. As well as providing a route of entry, medical devices, which are themselves foreign to our body, can make infection clearance more challenging for our immune systems. “One study in humans showed that it only took 100 Staphylococci bacterial cells to cause an infection when there is a foreign material, whereas it took over 10,000 times more cells of the same type to cause an infection without a foreign material” commented Dr Phillips. The protected nature of a biofilm and slow growth of cells at its heart make treatment of biofilms with antimicrobials challenging. Genetic exchange between the bacteria within the biofilm means that antibiotic resistance genes may spread through the population. “Experiments in our laboratory have shown that bacteria in biofilms survive treatment with some antibiotics at concentrations that are 10,000 x that which is normally considered a minimal inhibitory concentration (MIC) for the planktonic bacterial cells” stressed Dr Phillips. The mouth, whilst providing habitable niches and a potential ready source of nutrients, can be a challenging environment for bacterial survival. Shear forces from saliva, food and drink and associated sudden temperature changes are just some of the challenges facing any bacteria wishing to take up residence. Consequently, the protection offered by a biofilm mode of growth leads to an abundance in our mouths. Triggers for transitioning from a healthy to unhealthy population can include ill health of the individual but can also be factors as simple as diet. Frequent intake of fermentable carbohydrate for example is the predominant trigger for dental caries. To reduce harmful biofilm formation and improve treatments, it is vital that scientists have a good understanding of the pathogenic processes and interactions that are occurring in the mouth at the molecular level and can move beyond observational correlations. One aspect that is of particular interest to the group is the role that extracellular DNA (eDNA) plays in facilitating and stabilizing oral plaque biofilms, with in vitro studies already having shown that DNases can successfully disrupt mature oral biofilms. “Given its complexity, a coordinated and combined approach utilizing -omic technologies, mathematical modelling of community dynamics, advanced multispecies models, and molecular characterization of intermicrobial interactions will ultimately be needed to fully elucidate the critical drivers of oral plaque biofilm community composition and pathogenic potential.” Dr Nobbs stressed. Considering the bigger picture Dr Nobbs concluded “The recalcitrance of biofilms to antimicrobial agents and their role as ‘hotspots’ for genetic exchange also means that the development of novel strategies to disrupt biofilm formation will likely make a significant contribution to ongoing efforts to combat the growing crisis of antimicrobial resistance”.